Secretary-General António Guterres speaks at the al-Azhar Mosque in Cairo, expressing his solidarity and underscoring the need to fight the scourge of Islamophobia, as well as all forms of hatred and bigotry. 2 April, 2019. 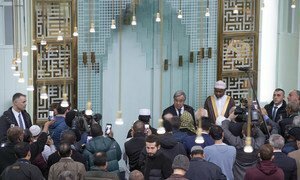 Mr. Guterres arrived at the more than 1,000-year-old mosque and centre of Islamic scholarship in the Egyptian capital, as “a man of faith”, he said, to show his solidarity with the faithful, in the wake of last month’s massacre at two mosques in New Zealand by a self-avowed white supremacist. “As the holy Quran says in Surah Fussilat, verse 34, ‘Good and evil deeds are not equal. Repel evil with what is better, and then you will see that one who was once your enemy, has become your dearest friend.’” said the UN chief. He noted the similar attack by a lone gunman on Jewish worshippers at a Synagogue in the Pennsylvanian city of Pittsburgh last October, where as in the Christchurch aftermath, concerned citizens of other faiths, rallied to support and protect survivors. “This is the spirit that I know is deeply embedded in Islam – a faith of love, compassion, forgiveness, mercy and grace”, said the UN chief. With hate speech “entering the mainstream” and “spreading like wildfire” through social and traditional media, he noted that it was infecting both liberal democracies and authoritarian States. “These dark forces menace democratic values, social stability and peace. 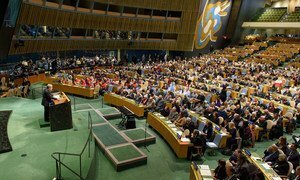 They stigmatize women, minorities migrants and refugees,” he said. Faith leaders “have a very important role” Mr. Guterres said, noting that his host, the Grand Imam of al-Azhar, Sheikh Ahmed al-Tayeb, had joined hands with Pope Francis in Abu Dhabi in February. “As the Grand Imam stated, Muslims have paid a heavy price due to the actions of ‘a handful of criminals.’ He also stressed that ‘all religions agree that God forbids killing,’” added Mr. Guterres. He noted that the Grand Imam had also called for Muslims in the Middle East to protect Christian communities, who have been subjected to terror at the hands of fundamentalist groups such as ISIL, or Da’esh. Later in the day in Cairo as part of his extended visit to the Middle East region this week, Mr. Guterres toured the Grand Egyptian Museum describing it on Twitter as “an impressive reminder of how the Arab world opened the door to epic discoveries and possibilities”.